3M™ Exterior Attachment Tape is a high performance automotive tape ideal for attaching exterior automotive body side moldings, wheel lip molding, door edge molding, badges, nameplates, emblems, LED Lights and trim. 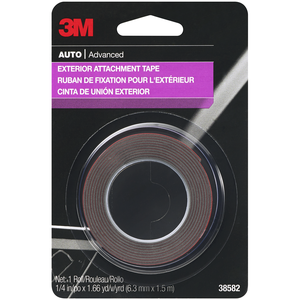 3Mâ„¢ Exterior Attachment Tape is a high performance automotive tape ideal for attaching exterior automotive body side moldings, wheel lip molding, door edge molding, badges, nameplates, emblems, LED Lights and trim. The tape creates a strong bond and is easy to use. Simply cut to size or fit and no mess during application, versus using a liquid adhesive. The super strong molding tape holds securely through road or weather conditions, such as sleet and rain that a vehicle may encounter. It also can help to reduce unwanted noise and vibrations on or around the vehicle by deadening the sound that vibrates through the vehicles metal and aluminum components.